Finding your way around the campsite or the inside of your tent at night is easier when you’re packing one of the best camping lanterns for outdoor living. Amusingly, it only becomes clear how useful these are when you don’t have one. Ever tried navigating your way to the toilet block in darkness? Exactly. Luckily, the paraffin Tilley lamps of yesteryear are now merely a hipster’s daydream, as modern camping lanterns pack a real lighting punch for their minimal weight. They don’t need require wick trimming or pumping up every few minutes, either. Lantern use hasn’t changed much since the 1600s. On a basic level, these portable outdoor lights illuminate campsite areas such as your table, or inside your tent, enabling you to eat, read, plan a hiking route, or play cards hands-free. Choose a smart option with customisable light colours and you can introduce ambience to your basecamp. Oh, the luxury! As you’ll see from our list of the best camping lanterns below, there are many shapes and sizes available. So the broad questions to consider when choosing the right lantern for you are run (burn) time, weight and power type. Weight is more of an issue if you’re trekking the Highland Way and carrying camping gear on your back. Car camping devotees need not concern themselves with weight and can instead opt for a feature-packed lantern that's perhaps a little heavier. Car camping and campervan holidays are on the rise, with many of us opting for a splash of luxury camping gear when doing so. Nothing says luxury camping lantern quite like the Biolite BaseLantern XL and Power Bank. 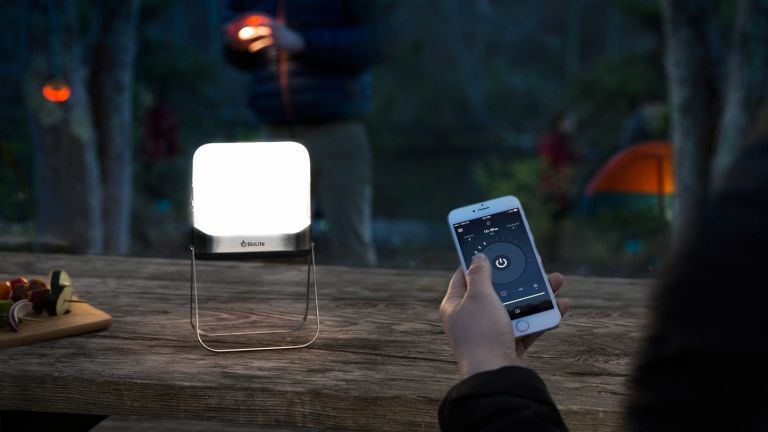 This durable, Bluetooth lantern brings smart lighting to the outdoors, enabling you (via app or integrated controls on the lantern) to customise the lighting colour and the lighting schedule. It also offers sleep timers and proximity activation. How do camping lanterns differ from torches? The most blinding difference between torches and camping lanterns is that lanterns either stand on a flat surface, or are designed to clip onto tentpoles, table legs and the like. This way, they can create a bright pool of illumination. In a group camp, this is invaluable, especially for finding your particular basecamp again after you’ve nipped off to the loo in the dark without your head torch. A well-placed camping lantern also makes socialising easier, enabling you to wine and dine or to play cards or read well into the evening. Weight is an important consideration and will inform your buying decision as much as run (burn) time. Chunky camping lanterns that provide illumination whilst charge multiple gadgets are jolly handy when car camping, but lugging them off to a wild camp in the Trossachs will be a pain. Luckily, there are many ultra-lightweight models featured in our best camping lanterns list, so even the most remote campsite can revel in the pleasures of nighttime lighting... even if it’s just for playing cards while tucked up in your sleeping bag. In terms of run time, try an LED light, as older bulbs eat batteries for lunch. Whether you go rechargeable or battery-powered is down to the length of your average trip. Rechargeable models boast enormous run times thanks to improved lithium batteries. If you’re embarking on a longer expedition that’s off the beaten track, standard batteries make sense as you won’t be near a mains supply to top-up your rechargeable camping lantern. Expert tip: it’s worth choosing a lantern that uses the same size battery as your head torch, preventing the inevitable hunt for the one remaining pair of AAs in an electrical storm. Many of the best camping lanterns incorporate a USB-power port so that you can charge devices like phones and action cameras. Do the maths beforehand if you’re relying on one of these to charge vital equipment when you're away on a trip. A 3,000mAh battery should give one older phone a full charge (roughly), so adjust this according to the number of devices and charge time. Keep in mind that extreme cold and heat losses involved in charging multiple devices will reduce the battery’s overall output. The Biolite base lantern is perhaps the most techno of all camping lights. While others may simply incorporate smartphone charging, the Biolite has its own app, so you can program the button light settings (kitchen, reading, bedtime, etc), as well as set the colours. By connecting other ‘nanogrid’ light units these can also be controlled from your phone, or set as proximity lights, or timed. The ‘nanogrid’ range includes strings of fairy-light style devices, downlighters and overhead lights, so your Glasto campsite will be the envy of all, as well as a magnet for moth like visitors. Stainless steel legs for durability and a solid 12000 mAh rechargeable powerbank battery make this the ultimate base camp lighting system - go off grid in style! A close second in our best camping lanterns guide, the Alpkit Trinity is a cracking little lantern that doubles up as a torch. With a 190-lumen beam, it’s powerful enough for both tasks. Competitively priced and lightweight, this is a no-brainer for outdoors devotees who like to pack light. Standard AA batteries mean there’s no phone charging to be had here, but also means you can get spares anywhere on the planet, which is pretty useful. A single power button hits full power first, and dims down as you hold it, so gloved operation is simple. Tiny feet and a little hook arrangement cover off almost all possible lantern siting questions, and a hidden tripod screw thread covers off even more. What more for you want for £20 quid? The Trinity Torch is available to buy direct from Alpkit. The Goal Zero Lighthouse is a traditional looking camping lantern that knocks out a decent number of lumens for its weight. It is a little on the heavier side, though not as beefy as the Biolite. The big sell here is the built-in hand crank. Because of this, even in the darkest, most remote, electricity free situation, you can crank away and get some light. The Lighthouse also has robust legs and a hook to hang from, and an ingenious arrangement whereby you can select 360 or 180 degree light; the latter saves on battery power. Finally, this camping lantern boasts a 4,400mAh lithium battery with a 1.5A USB output. This should keep a couple of phones juiced up for a day or two. So it's a jack of all trades, really, but luckily it's pretty darn good at all of them. This lightweight best camping lantern contender is ideal for stowing in a backpack for long camping trips. Considering it's so compact, it pumps out an impressive 225 lumens (max setting), projecting light through a diffuser globe to create an ambient vibe. There are strobe and dimming modes to tinker with for adjustable brightness. The Black Diamond Apollo Lantern packs in a handy dimming function too, and it can charge smaller gadgets via USB. When it runs out of juice, you can recharge the internal lithium-ion battery or pop in a few AAs. Check the power meter display to see how it's doing for juice. This versatile camping lantern can be hung from your tent, or you can pop out its folding legs to sit it sturdily on the ground or on a table or other flat surface. Forget about packing a separate portable smartphone battery, because this lantern comes with a USB cable that both recharges its own integral battery and offers you a means of juicing up your phone. The real interesting feature here is BatteryLock, which helps to preserve power. By twisting the base of the lantern, you can disengage the batteries from their connectors. This action prevents the batteries from draining when the light is off, and keeps the lantern safe from acid leak erosion. In terms of lighting clout and performance, it pumps out 300 lumens on the maximum setting and 50 lumens on the low setting, which is ample for nighttime lighting. The beam distance is 8m on the highest setting, and 2m on the lowest. Coleman's water-resistant Twist BatteryLock Lantern is quite rugged too, and should survive a few bumps and knocks on the way to the campsite. The 60 lumens output sounds a tad low compared to the other models featured in our best camping lanterns buyer’s guide, and it's fairly hefty compared to some of the mega-lightweight lanterns, but we have a soft spot for this Vango beauty. The Galaxy Eco Rechargeable has an integrated solar panel, so you can charge it by sunlight—no more batteries. No more cost. If you’re camping in lousy weather, you could always recharge the light via your car’s charger (adaptor included). This eco-friendly camping lantern with built-in rechargeable battery has two unique lighting modes. Simply switch between them to meet the needs of your tent as and when you need either a softer or brighter light. As for how you use the Galaxy Eco, you could hang it inside your tent via the attached hook, or carry it around then plonk it down on your camping table or wherever else you need to shed some light. When festival camping, there's nothing worse than having to hunt around your tent for your phone charger when all you really want to do is go watch some bands. Save yourself the hassle by plugging your phone into Mr Beam's USB port and fully charge your phone up to three times (depending on your phone's battery size) from the lantern's onboard power reserves. Mr Beams is weatherproof too, so won't mind some festival rain if you don't. High-quality LEDs provide 30 hours of light on a single set of D batteries. Not the most eco-friendly choice, but this ultra-bright lantern is often on sale for less than £20 so won't eat into your festival budget too much. A trio of COB LEDs ensures this budget-friendly camping lantern provides a bright pool of illumination inside and outside your tent. The no-frills design means it's easy to use too: simply lift the top to activate, then push it down to turn off the light. The water-resistant design keeps it safe during rainy walks to the toilet block at night, and its compact size (5-inches tall and 3.5-inches wide) won't take up much space in your backpack. If you need a camping lantern but don't have much money to spend on one, and are happy with a basic light that's very simple to use, the HeroBeam is worth the money. Ultimately, there are two ends to this spectrum: the basecamp monster at one end, and an ultralight, trekker-friendly lantern at the other. The Biolite BaseLantern XL and Power Bank is our top pick for the best camping lantern overall. It’s overkill for trekking and backpacking, but enormously enjoyable for car camping, campervan holidays and longer camping trips where things like ambience and programmable lighting schedules are of greater importance. If you want a lightweight lantern that can be stuffed into a backpack and carried without issue, and you don’t need smart lighting controls, choose the Alpkit Trinity. Bonus: it doubles as a torch.